Filip Stojanovski is Program Director of Metamorphosis Foundation. He holds a BSc Degree in Computer Science from Graceland University (USA) and Masters in e-business management from Université Paris 1 – Panthéon Sorbonne (France). His responsibilities within Metamorphosis Foundation include project coordination, research and resource development. From 2012 to 2017 he served as chief of party of the USAID supported Media Fact-Checking Service, and is currently serving as project manager of EU-supported project Critical Thinking for Mediawise Citizens – CriThink. 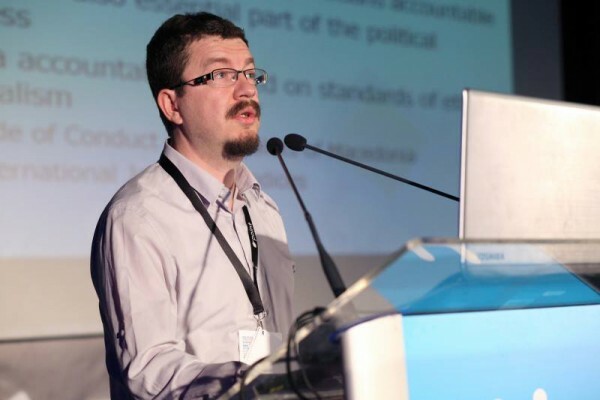 Since 1995 Filip has been active in the Macedonian civil society through volunteer projects in the area of consumer protection and e-publishing, and through professional involvement as an IT expert. He is also a contributor on information society topics to the traditional and new media in Macedonia, and Eastern & Central Europe editor at Global Voices. In 2005 he was a member of the Task Force for National Strategy for Information Society Development.